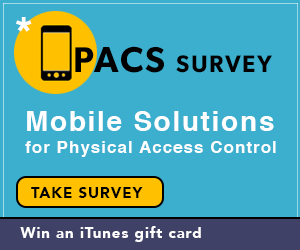 To gauge the current state of mobile access in the real world CR80News’ sister publication SecureIDNews, along with HID Global, are asking for your input. Please take a few minutes to answer seven questions related to the use of smartphones to access buildings, doors and gates. The survey is anonymous but if you provide your name and email, we will randomly draw three iTunes gift card winners. Thanks for your support and look for the results to be announced next month at ISC West and online at SecureIDNews.